The first book I read of Lisa’s was Ralph’s party, followed by Thirty nothing. And surprisingly, at the ripe old age of 17 these books really spoke to me. I remember really identifying with the characters, in spite the obvious age difference. As an author, I had not been following Lisa’s Work and then then a few weeks ago, whilst moving, I found those books and decided it might be an idea (now I’m actually in my 30’s) to re-read. I haven’t actually got that far yet, because I’m the mean time, I discovered her new book. Just as her early books, I found this book a delight to read. Easy to pick up and hard to put down, just what I like in my fiction. The plot is a good one, mystery and intrigue all wrapped up in everyday life. In spite the unlikeliness of the mystery, it is completely believable because of the way in which Lisa writes her characters. Not once do you disbelieve how Laurel (arguably, the main character) acts or reacts, each of her behaviours and actions is discussed and you really feel as though you are going along this journey with her. About a third of the way through, I got the feeling that I knew where the story was going, but how she would achieve this goal was intriguing. Knowing what was coming did not in any way distract from my enjoyment of reading this book, I found that I genuinely wanted to know what happened to the characters and how they got to what I believed would be the end point. In fact even though I thought I had a fair idea of what was coming, Lisa still managed to throw in a couple of twists that I had not predicted. Lisa guides Lauren through the emotional roller coaster of re-living the disappearance of her daughter all those years ago. You feel her pain, you see the shell of a woman that she had become so clearly. And then you follow her as she begins to learn to accept and move on. The story jumps from ‘Now’ to ‘Then’. This allows you to experience what happened to Ellie and what she was going through at the same as seeing the effect this has on Lauren and her family. The use of shifting time works really well and progresses the storyline whilst all the while keeping you emotionally attached to the characters. I’ve mentioned this tool before in my review of ‘The Girls by Emma Cline’. I feel that Emma lost her way a little using this. Lisa however, seems to have a very good grasp of how to sign post for the reader whose story and when we are in the timeline, which makes this story a lot easier to read than Emma’s novel which uses a similar technique. This could be due to Lisa’s writing experience. 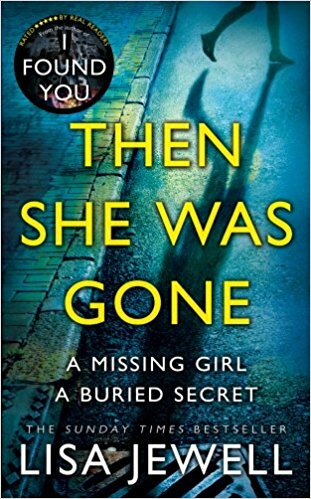 With a back catalogue of no less than 15 books prior to ‘Then She Was Gone’, I feel she has had a lot of practice in honing her skill and finessing the readability of her work. Ellie is not just a Macguffin in the story, she is a fully formed character who has he own thoughts and feelings, who experiences fear and pain. Lisa allows you to follow her on her journey and experience these emotions with her. This allows you to be emotionally attached to the character of Ellie and deepens the emotional investment you have. The story for this book does seem a little far fetched on the face of it and I can only imagine the raised eyebrows that Lisa would have received on presenting the synopsis to her publisher. Lisa’s writing style brings a whole level of believability to it. So much so that you don’t once question it’s strangeness. In the acknowledgements Lisa thanks her editors for making sense of the story. I am realising more and more that editors can sometimes make it break a story with subtle suggestions and in some cases I have read books which are screaming out for an editors guidance. That is not to take away from Lisa’s ability and talent to create believable and loveable characters. A nudge on the story line from an editor still needs to be backed up by the ability of the author to sculpt these changes around the already developed and written story. I thoroughly enjoyed this book, couldn’t put it down and ended up finishing it in record time. I would certainly recommend it to others. A book that you can completely immerse yourself in. This one is definitely staying on the bookshelf for a second read. She was fifteen, her mother’s golden girl. She had her whole life ahead of her. And then, in the blink of an eye, Ellie was gone. Ten years on, Laurel has never given up hope of finding Ellie. And then she meets a charming and charismatic stranger who sweeps her off her feet. But what really takes her breath away is when she meets his nine-year-old daughter. Because his daughter is the image of Ellie. Now all those unanswered questions that have haunted Laurel come flooding back. What really happened to Ellie? And who still has secrets to hide?